We have some sweet potatoes left-over from last weekend and a half bag of spinach, so to ensure they don't go to waste, I thought we would have a weeknight curry. Everyone loves a good curry and this dish is extremely tasty. 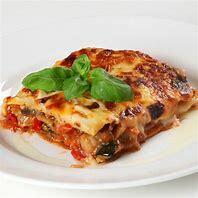 Why not try this simple recipe? 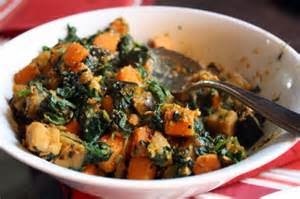 Cook the sweet potato in a large saucepan of boiling water for 8-10 minutes, then drain and put to one side. Heat the oil in a saucepan, add the onion, garlic and turmeric and fry over a gentle heat, stirring often for 3 minutes. Stir in the chilli and fry for another 2 minutes. Add the coconut milk, stir well, then simmer for 3-4 minutes util the coconut milk has thickened slightly. 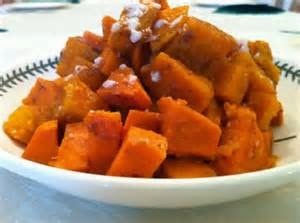 Stir in the cooked sweet potatoes and a dash of salt, then cook the curry for 4 minutes. 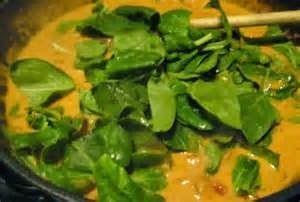 Cover the pan and simmer gently for 2-3 minutes, or until the spinach has wilted and the curry has heated through. 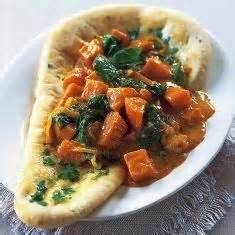 Serve with naan bread or chapattis.